Immaculate split 2 bed 2 bath home in the heart of Chino Valley for under $100k! New roof 2016, new furnace 2017, all city utilities, low taxes, low utility costs, raised ceilings, convenient to shops… turnkey, don’t miss! Set in a quiet neighborhood, boulders, and pines, this is the perfect second home or primary residence! This Home has the best of both worlds, privacy and peace, only 5 minutes from downtown Prescott. Freshly painted, room for gardens, no neighbors behind, and a large carriage house could be storage or a shop. – Open space adjacent provides great views! Turnkey, handicap accessible, home in Unit #19, completely updated & move-in ready! Located near the High School, shopping, parks, PV Event Center. NEW: garage door & opener, hot water heater, cabinets & countertops, stainless steel appliances, vanities & tops, shower, tub, & enclosures, tile floors & carpet, lighting & ceiling fans, plumbing fixtures, paint inside & out, windows & blinds. Furnace & ductwork fully serviced, sealed, & cleaned. Open space adjacent provides great views! Owner is meticulous! Immaculate split 2 bed 2 bath home in the heart of Chino Valley for under $100k! New roof 2017, new furnace 2017, new paint 2017, all city utilities, low taxes, low utility costs, raised ceilings, convenient to shops… turnkey, don’t miss! Set in a quiet neighborhood, boulders, and pines, this is the perfect second home or primary residence! 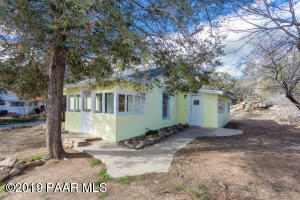 The new owners will have the best of both worlds, privacy and peace, only 5 minutes from downtown Prescott. Freshly painted, room for gardens, no neighbors behind, and a large carriage house could be storage or a shop. New: Roof, Floors, Carpet, Bathrooms, Kitchen, Paint interior and exterior, fixtures, and lighting! Don’t miss your chance to own a home that has been meticulously renovated and remodeled so you don’t have to! This home needs nothing! Perfect Home for Under $300k!!! Four bedroom split floor plan home features new kitchen, bathrooms, flooring, lighting, painted inside and out. Roof is approximately two years old. Home is located within walking distance of Bob Edwards Park and just a couple minutes from hospitals, schools, and shopping. Better than new in desired Unit 19 with established landscaping including a Mimosa tree, roses, and more. Backyard is fenced with additional side yard fenced for a potential dog run. Listing information is deemed reliable, but not guaranteed. IDX Solution Provided by iFoundAgent.com 2019 - PAAR Listing Data last updated April 23, 2019, 7:19 pm.